January 31, 2019 – It is an often forgotten piece of World War II history that between 1942 and 1946, 425,000 German, Italian, and even some Japanese prisoners of war were held at 700 POW camps in 46 U.S. states. All except the Japanese got here on troop transport ships that would have otherwise returned from Europe empty. A new book, The Complete Book of World War II USA POW & Internment Camp Chits. 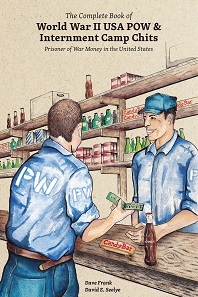 Prisoner of War Money in the United States, by Dave Frank & David E. Seelye, is a comprehensive look at one of the overlooked, yet more intriguing aspects of the camps’ operations – the money, or “chits” that the POWs used for discretionary expenses in their camps, such as for cigarettes, candy, paper and postage, 3.2% beer, or other items. Dave Frank and David E. Seelye, The Complete Book of World War II USA POW & Internment Camp Chits. Coin & Currency Institute, Williston (VT) 2019. 256 pp., fully illustrated in color. ISBN: 978-0-87184-404-0. $39.99 (print), $19.99 (e-book). 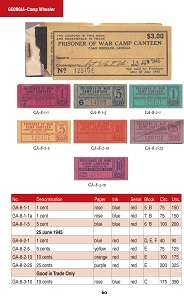 Rather than employing a unified payments system, the camps issued their own ticket-like chits in booklets prepared under contract by private printers. The first accounting of these chits was in Die Kantinenschecks der Deutschen Kriegsgefangenen in den U.S.A., written in 1953 by Albert Pick, himself a former German POW, who would go on to become a legend in world paper money. A few other books followed, the last over twenty years ago. The Complete Book of World War II USA POW & Internment Camp Chits, by Messrs. Frank and Seelye, both recognized experts on the topic, has been years in the making, and is by far the most comprehensive work ever done on the subject. Examples of the money POWs used at Camp Wheeler in Georgia. The book contains brief histories for most of the camps, and even some anecdotes. (One of the more amusing ones concerns a days-long protest by German POWs in Nebraska over a delay in a shipment of beer, over which they were already aggravated because of the low alcohol content.) Chits and the booklets they came in are illustrated in color. Prices are given in used and new conditions with a new numbering system devised by the authors. Historical maps, documents, and photographs are interspersed throughout. For those who don’t collect them, this is a book that could make them want to start. It’s a fascinating view of an overlooked part of U.S. numismatic heritage. Copies of the book may be obtained from the Coin & Currency Institute.